Jaroslav Kalfar was born and raised in Prague, Czech Republic, and immigrated to the United States at the age of fifteen. He earned an MFA at New York University, where he was a Goldwater Fellow and a nominee for the inaugural E. L. Doctorow Fellowship. He lives in Brooklyn. This is his first novel. Kirkus Reviews "10 of Our Favorite Debuts"
The Verge "23 science fiction and fantasy novels to read this March"
"Kalfar has much larger aims with Spaceman of Bohemia than to write a spry, madcap work of speculative fiction . . . He has such a lively mind and so many ideas to explore . . . Kalfar has an exhilarating flair for imagery. He writes boisterously and mordantly . . . His voice is distinct enough to leave tread marks . . . A frenetically imaginative first effort, booming with vitality and originality." The author skillfully splices a barbed picture of the Czech Republic between Jakub's misadventures in the cosmos. "These include floating free inside the dust cloud and hitching a ride on a clandestine Russian space shuttle. The book suggests that every national hero has a dark side, though you may have to leave Earth to see it. "—Sam Sacks, Wall Street Journal "Best New Fiction"
"Blend Bradbury and Lem with Saint-Exupéry and perhaps a little Kafka, and you get this talky, pleasing first novel by Czech immigrant writer Kalfar....a book built on sly, decidedly contrarian humor. Blending subtle asides on Czech history, the Cold War, and today's wobbly democracy, Kalfar's confection is an inventive, well-paced exercise in speculative fiction. An entertaining, provocative addition to the spate of literary near-future novels that have lately hit the shelves." 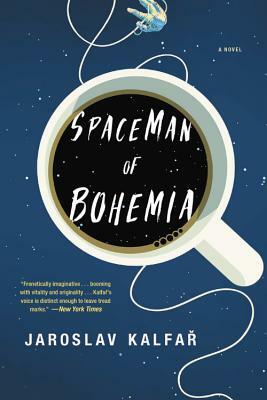 "Spaceman of Bohemia is an out-of-this-world look at all our beautiful smallnesses, from the cells of our biology to the bacterial minutiae of one broken heart. The roar of revolution and governmental injustice is cast against the depths of our emotions and the bottomless, grateful silence of the stars. Jaroslav Kalfar has spun an unforgettable tale, a poignant interplanetary work that collapses the distance between us with the beauty of its language and the unstoppable wonder of this universe he's created." "Kalfar's writing has the same hyperactivity, and fidgety contempt for generic boundaries, as that of the young Safran Foer.... Part space opera, part folk tale, his novel is also a love song to the city of Prague.... Funny, humane and oddly down-to-earth in ways that its scenario cannot possibly convey."